 The 60-Key Expansion Console from Action CTI connects quickly to most current ESI desktop phones. Optional Expansion Consoles from Action CTI connect quickly to most current ESI desktop phones, helping you more effectively manage your ESI system, particularly as it expands to meet your business needs. When your business grows, your ESI phone system expands with it. Versatile — Combines with a compatible ESI desktop phone for any extension. The 60-Key Expansion Console is compatible with these ESI phone models (digital or IP): ESI 60 Business Phone; ESI 40 Business Phone; and 48-Key Feature Phone. Easy to use — Lets your operators transfer calls to any extension with just a keystroke. Powerful — Adds 60 more programmable feature keys to those already on the ESI desktop phone, giving the user a total of up to 108 such keys. 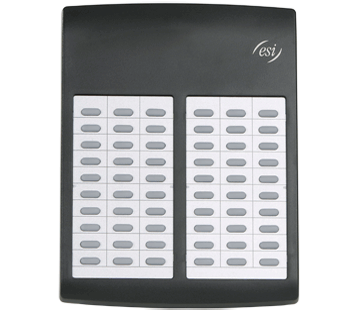 Easy to understand — As does each ESI desktop phone, uses tri-color LEDs to show the simultaneous status of all extensions programmed into the soft feature keys. In fact, if you manage a large department, you may well want this just for its ability to show you, at a glance, your employees’ phone activity. For even more monitoring-at-a-glance, add the optional ESI Presence Management. Compact footprint — Takes up little valuable workspace, especially since it has a convenient multi-position base. If 108 keys aren’t enough, simply add the Second Expansion Console — available for the IP Server 900, ESI Communications Servers, and (legacy) IVX X-Class systems — connects directly to the 60-Key Expansion Console so your extension can have up to 168 programmable feature keys.